With 22% of the national population (11.2 million inhabitants), the Gauteng city-region is the largest and richest region in South Africa, contributing to one-third of national GDP. The area encompasses a series of connected cities, including Johannesburg and the national capital of Tshwane (formerly Pretoria), that function as a single, integrated region. Gauteng has been South Africa’s growth engine: for every additional 1% growth in population in the province, 1.6% is added to its contribution to national growth, implying higher productivity than in other parts of the country. Nevertheless, the city-region’s growth potential is constrained by deep socio-economic challenges, including high unemployment (26.9%) and low productivity growth. Its rapid demographic and economic development has also reinforced the spatial segregation instituted under apartheid. Against the backdrop of South Africa’s achievements since the fall of apartheid, this Review evaluates measures to position economic development policy and to confront economic inequality in Gauteng. The issues of adequate housing as a catalyst of economic development and a vehicle for socioeconomic integration, transport mobility and public service delivery are examined in detail. The Review also assesses the economic growth potential of the manufacturing and green sectors, as well as governance issues, focussing on the potential of intergovernmental collaboration in advancing a cross-cutting regional approach for Gauteng. The Gauteng city-region, with a population of 11.2 million inhabitants (22% of the national population), encompasses a series of connected cities, including Johannesburg and the national capital of Tshwane (formerly named Pretoria), that function as a single, integrated region. Population is growing rapidly, especially from in-migration: 3.2 million residents were added to the Gauteng city-region between 1995 and 2009. 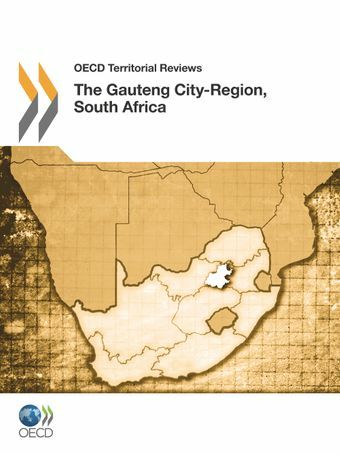 Compared to OECD metro-regions, the Gauteng city-region features the highest growth rate, growing at more than 2.7% annually between 1997 and 2007, nearly three times as fast as the OECD metro-region average (0.96%). The Gauteng city-region accounts for 34% of South Africa’s GDP, 11% of Africa’s GDP, 52% of the share of national R&D (2008-2009), and 63% of national trade. Key challenges include high unemployment (26.9%), HIV (12%), and low life expectancy (51 years). Improving education and apprenticeship programmes: upgrade apprenticeship training, improve the relevance of training in public institutions, and spearhead a campaign to attract and retain teachers. Increasing the supply of modest cost housing: facilitate the construction of more affordable homes; incubate a larger non-profit housing development community; and increase mixed-cost developments. Improving mobility by enhanced transportation-oriented development and growth management: develop mechanisms to encourage drivers to switch to public transport; support broader experimentation with transit-oriented development including incentives for developers. Improving productivity growth: expanding tertiary and vocational education; enhancing technological capacity of firms; enhancing linkages between government and the academy. Expanding Gauteng’s green growth: place Gauteng city-region in the pole position to create new sectors in renewable energy and clean tech in Africa and beyond; expand solar energy provision; leverage the green economy as a basis for regional export. Enlarge city-region environmental policy-making: enlarge intermunicipal co-operation on waste collection and disposal, develop a metropolitan approach to climate change action planning, and deepen metropolitan cooperation on environmental data collection and management.